Mr. Narendra Waghela has been living and working in Leicestershire for over 41 years. The two things that make him feel truly fulfilled are when he is with his family, and when he is doing something to help make real a difference in his community and city. 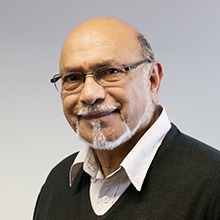 Narendra has gained a wealth of experience and knowledge on social, political and economic issues through being a Trustee Board Member of several organisations, a key member of various organisations in Leicestershire and over 31 years as a Senior Project Manager, Business Co-ordinator and Scheduling Manager with an International Design and Production Company. As well as his business skills, Narendra has also used his valuable personal attributes such as his natural empathy, ability to make a fair and sound judgement, and problem solving skills. His unique role with BAPS, working with today’s youth with the difficult objective of keeping them away from drugs, street crimes, smoking and alcohol, has been extremely rewarding. As a member of the Valuation Tribunal Services, Narendra has been involved in dealing with sensitive issues through working with people of different backgrounds. With his ability to speak English, Gujarati, Hindi, Punjabi, and Swahili and Urdu he has on many occasions helped as interpreter and translator in some ‘sensitive’ conditions. Through the work that Narendra does in the community, he feels a real sense of satisfaction and that he is making his contribution towards the betterment of our society.